WHITE LIGHTNING: Just Saying: Online Shopping = Evil ? Just Saying: Online Shopping = Evil ? 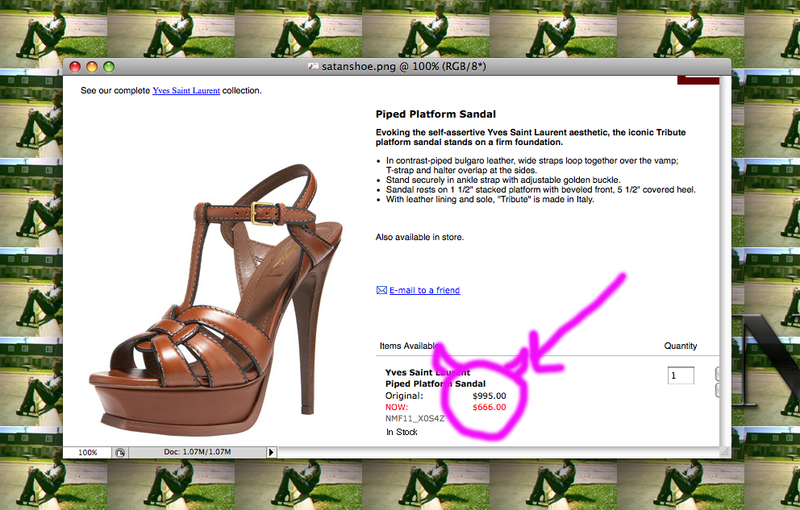 Perhaps online sale shopping IS the work of the DEVIL?! I have thought this before, but now I see it may be TRUE. IT'S SALE TIME AT NEIMAN MARCUS! THE POWER OF THE PLATFORM COMPELSSSSSSS YOUUUUUUUUU! HAIL Y S(ATAN) L !!!! Labels: hilarity, shoes will bury me alive one day, wha? This is slightly unrelated but who was in charge of writing that description? "Evoking the self-assertive Yves Saint Laurent aesthetic, the iconic Tribute platform sandal stands on a firm foundation." Maybe it's just me, but I found that completely ridiculous. elizabeth & james jeans on ebay, size 27 for $110! Really digging your blog and your style. It rocks! Satan Lives! THE BEST! Me & my lunch table say that ALL THE TIME! That's not the work of the devil. The devil wears Prada. i confirm online shopping is the devil. I release the need to blame anyone, including myself. We all doing the best that we can with the understanding, knowledge and awareness we have.